First workshop: December 1-2, 1:00-5:00pm. Second workshop: Saturday, December 11, 9:00am-5:00pm. In addition to the demonstrations of how to use Legacy, students will also have hands-on practice along with assignments and handouts to best learn the software. Registration is open to anyone and is free. Contact David Midgley for more information or call the FHC at 435-673-4591. The workshops will be held at the St. George Regional Family History Training Center located across the street from the St. George LDS temple. Just in time for the holidays - all Legacy Family Tree 7 software is $10 off until December 31, 2010. Aren't the holidays great? We appreciate all of our Legacy users so much and we thank each of you for all of your support over the years. We would like to offer each of you a gift that we think your family and friends will really enjoy. Click here to purchase or call 1-800-753-3453. Buy as many shippable products at the same time, and shipping never goes up - one flat rate! Nearly every Legacy add-on, training video set, and how-to book has been discounted for this holiday sale, including Paul Larsen's popular book, Crash Course in Family History and Marlo Schultz' The Digital Family History Guidebook. Our 7th annual Legacy Genealogy Cruise has concluded. We all had the time of our lives. I'm now trying to recover from a couple of new syndromes I picked up: 1) a severe case of desynchronosis (jet lag), 2) an even more serious case of I-sure-enjoyed-not-making-my-own-food-or-cleaning-up-after-myself, and 3) the "I ate too much good food and didn't exercise enough" syndrome. However, after 2 1/2 days of being home now, I have lost 7 pounds. It's not so hard going back to work though because I absolutely love what I do. Whilst (a new word for me) in Australia and New Zealand, we saw kangaroos, kiwis, the Mauri Haka, waterfalls splashing into the sea, and even a few whales. My wife and I climbed Mt. Maunganui, toured the Cadburry Chocolate Factory (where I discovered new taste buds), explored the Gloworm caves, danced, read, slept, and have I mentioned - we ate lots of food? While (I just can't get used to the word 'whilst') teaching classes and speaking with our Legacy cruisers (about 2/3 were from Australia and New Zealand) I learned that "I" was the one with the strong accent. And I loved hearing the Aussies welcome me with a "g'day mate". They really say that - I thought it was just something they said in the movies. Anyways, I grew to love the people in our group, especially those from "down under" - they are such a warm, friendly people. My favorite part of the entire cruise was the Legacy classes. We were able to add about 4 1/2 hours of additional instruction, including personal one-on-one sessions. Two of our cruisers, Jan Gow and Wayne Anderson, gave brilliant (another of my new favorite words) classes on various aspects of genealogy technology. My favorite class was Wayne's serendipity stories, which concluded with others in the group sharing their own serendipity experiences. So...it is back to work for the Legacy development team. We have some great things planned for the near and not-so-near future. Happy Thanksgiving (my favorite holiday) to everyone in the U.S. this week. Below are just a few of the 249 pictures I took. The Fiordlands had hundreds of waterfalls spilling into the sea. This was the most beautiful part of the trip. Haka is a traditional dance of the Māori in New Zealand. I couldn't resist taking pictures of New Zealand cemeteries. Our ship - the Sun Princess. I guess I should conclude this article now. Our 8th annual Legacy Genealogy Cruise is just 10 months and 5 days away. We hope to see you next September as we cruise New England and eastern Canada. NOTE: To search these records, visit http://beta.familysearch.org. To volunteer to help index records, visit http://indexing.familysearch.org. Also, sign up for our next FamilySearch Indexing webinar, "Helping Unlock the World's Records: FamilySearch Indexing for Power Users". Click here to register. Tomorrow we leave to begin our 7th annual Legacy Genealogy Cruise, this year to Australia and New Zealand. The cruise starts and ends in Sydney, Australia visits the following New Zealand ports: Fjordland National Park, Dunedin (Port Chalmers), Christchurch (Lyttelton), Wellington, Napier, Tauranga, Auckland, and Bay of Islands. We will sail on Princess Cruises Sun Princess ship. We've also got 13 fantastic hours of personal Legacy and genealogy instruction from five different instructors. This paragraph is where I'm hoping to promise that I will publish daily articles about our trip like I did last year. Umm...I really want to...and I'm really glad I did last year...I'm still trying to talk myself into it...Let's see - dancing with my wife (alone - no kids!) on the Sun Princess or writing about the adventures of the Legacy classes....We'll see how it goes (just being honest here...). Our sincere thanks go out to our entire technical support and sales staff who will continue to provide sales and support services while we are gone. Thanks Jim, Sherry, Brian, Ron, Tim, Sarah, Leonard and Haybron for keeping us going! We'll either see you here or on the ship! Thinking about next year's cruise already? From September 29 to October 8, 2011, we will cruise New England and Eastern Canada. Visit http://www.legacyfamilytree.com/CruiseInfo_2011.asp for all the details. Sign up early for our next three webinars - the topics are fantastic but webinar "seating" is limited. Join one or join all three! Registration for every webinar is free and open to anyone. Register at www.LegacyFamilyTree.com/webinars.asp. Share Your Family History with Legacy Charting - Wednesday, December 1, 2010 - 9:00PM Eastern U.S. Learn how to share and publish your family history so everyone in the family can enjoy it. In this webinar, you will learn tips and tricks to using Legacy Family Tree's charting tools to create beautiful wall charts (for the next reunion), smaller trees (to hang on the living room wall), and even family tree bookmarks (makes great gifts). You will also learn how to include photos of your family add use your own images for the chart's background. Legacy Family Tree's Geoff Rasmussen and Generation Maps' Janet Hovorka will be the presenters. About the presenters. Geoff Rasmussen is the father of four budding genealogists. He has served as director and vice-president of the Utah Genealogical Association, and received his degree in Family History and Genealogy from Brigham Young University. He develops the Legacy Family Tree software and is the host of their webinars. Outside of genealogy, he enjoys playing the piano and cello and loves basketball. Janet Hovorka received a B.A. in Ancient Near Eastern History and a Master's degree in Library and Information Science from BYU. She accepted teaching and library positions at BYU and Salt Lake Community College before having her three wonderful children. She is currently serving as Vice President of the Utah Genealogical Association and has presented 100s of lectures all over the country to help people find out more about their family’s history. Helping Unlock the World's Records - FamilySearch Indexing for Power Users - Wednesday, December 8, 2010 - 2:00PM Eastern U.S. If you’ve graduated from the basics of FamilySearch Indexing, you’re ready to learn how to simplify and increase your work without decreasing your accuracy. This class, taught by FamilySearch's Katie Gale and hosted by Legacy Family Tree's Geoff Rasmussen, will discuss a variety of ways to enhance your indexing experience with program tips, tools, and more. If you are new to indexing, we invite you to view Jim Ericson's "beginner's" webinar in our archives. About the presenter. Katie is part of the workforce development team for FamilySearch indexing. She is currently responsible for communications, including the monthly newsletter, messages from headquarters, and blog articles. Google for Genealogists - Wednesday, January 5, 2011 - 2:00PM Eastern U.S.
About the presenter. Thomas MacEntee is a professional genealogist specializing in the use of technology and social media to improve genealogical research and as a means of interacting with others in the family history community. Utilizing over 25 years of experience in the information technology field, Thomas writes and lectures on the many ways in which blogs, Facebook and Twitter can be leveraged to add new dimensions to the genealogy experience. As the creator of GeneaBloggers.com he has organized and engaged a community of over 1,300 bloggers to document their own journeys in the search for ancestors. Last night's webinar, Organize, Share, and Publish Your Digital Photos with Heritage Collector Suite is now available in our webinar archives. Marlo Schuldt, developer of the Legacy Family Tree add-on software, gave us a fantastic overview of the software. Listen to the recording here. The webinar will be available in the archives until at least December 3, 2010. Marlo is also the author of The Digital Family History Guidebook. All live webinar attendees were given a special coupon code for 15% off Heritage Collector Suite and/or The Digital Family History Guidebook. The coupon heritage15 is valid through Saturday, November 6, 2010. Wednesday, December 1, 2010. Share Your Family History with Legacy Charting. Learn how to share and publish your family history, so everyone in the family can enjoy it. In this webinar, you will learn tips and tricks to using Legacy Family Tree's charting tools to create beautiful wall charts (for the next reunion), smaller trees (to hang on the living room wall), and even family tree bookmarks (makes great gifts). You will also learn how to include photos of your family add use your own images for the chart's background. Legacy Family Tree's Geoff Rasmussen and Generation Maps' Janet Hovorka will be the presenters. Are you ready for tomorrow's Heritage Collector Suite webinar? Is your digital photo collection a mess? Can you find any photo in seconds? Want some tips on creating family calendars and scrapbooks? Don't miss our next webinar on one of Legacy Family Tree's add-on programs, Heritage Collector Suite. The software's developer will give us an overview of their photo organization software in tomorrow's webinar entitled, "Organize, Share, and Publish Your Digital Photos with Heritage Collector Suite." If you have considered using the Heritage Collector Suite software, this is a great opportunity to see what it can do. 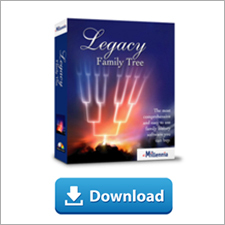 As a Legacy add-on program, the software integrates with your photos in Legacy Family Tree. If you already use Heritage Collector Suite, you will benefit from the insider tips Marlo will surely provide. Reserve your webinar seat today - "seating" is limited. Visit www.LegacyFamilyTree.com/webinars.asp to register. We have some great door prizes and discount coupons for the live attendees. Don't miss out. We will once again open the "lines" for your live questions. Wherever in the world you might be, if you have a microphone or headset, we can take your questions - live - for Marlo. To join the webinar, click on the link in your registration confirmation email. We suggest joining at least 15 minutes early. Last Wednesday's webinar, What's New in Family History Technology, by Paul Larsen, is now available to view in our webinar archives. Thanks to Paul (author of Crash Course in Family History) for all of the new information he shared with our live audience. Below is a list of the websites Paul mentioned. If you already have his e-book (PDF), all of these links are clickable in it. The e-book also contains hundreds (maybe thousands?) of additional links and other information. We hope to see you all this Wednesday for our next webinar with Marlo Schult: Organize, Share, and Publish Your Digital Photos with Heritage Collector Suite. 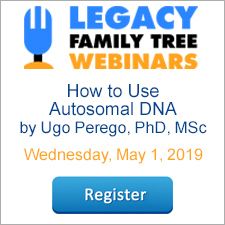 For more information and to register (free), visit www.LegacyFamilyTree.com/webinars.asp.